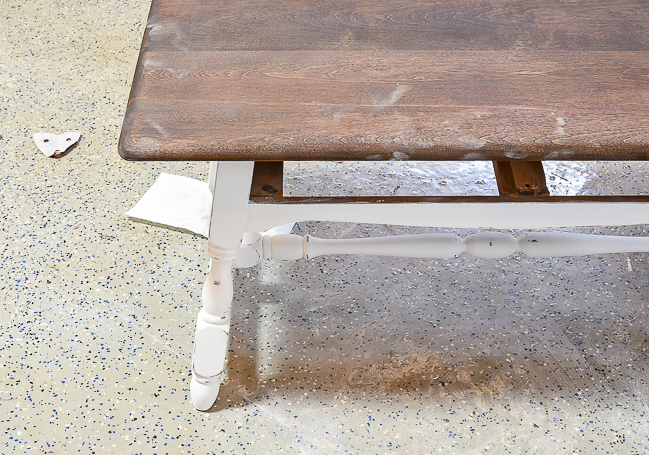 Learn how to easily refinish furniture without the mess of harsh chemicals and strippers. 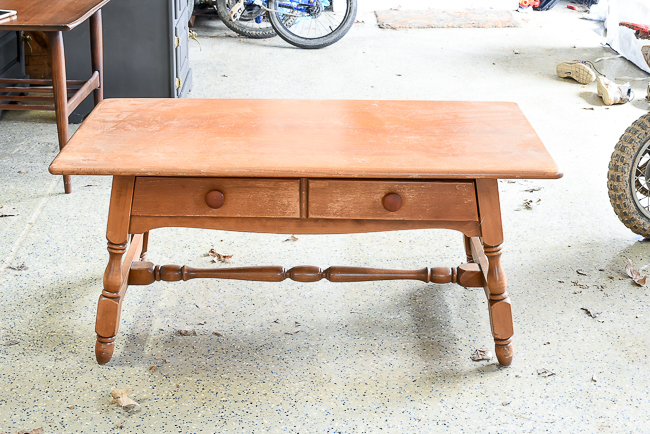 Have you ever passed up a piece of thrifted or hand me down furniture because you thought it would be too much trouble to refinish? I'm here to tell you it's much easier (and less messy) than you may think. 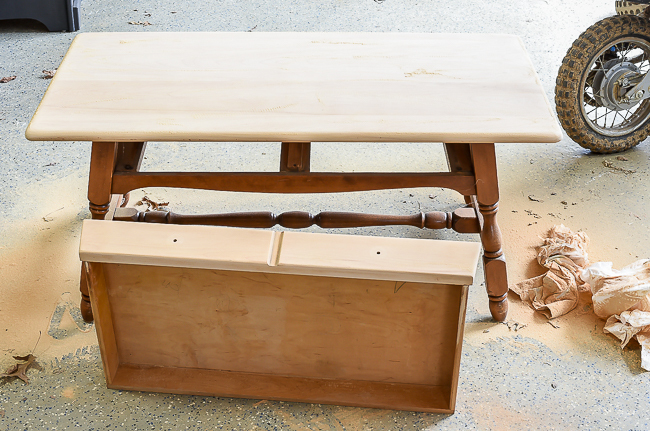 Sometimes furniture is too damaged and painting is your only option, but when solid wood furniture is in good condition refinishing should always be considered. 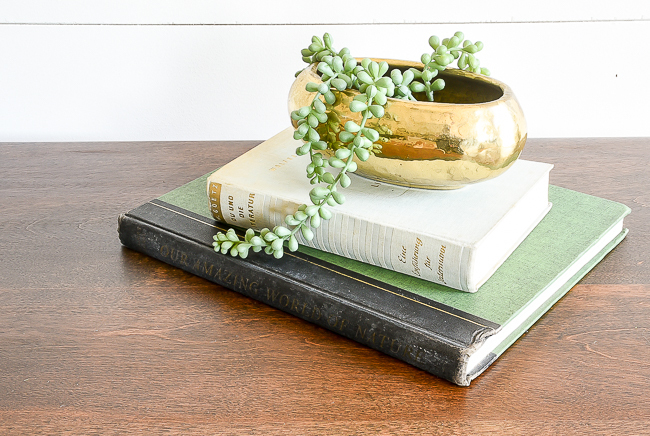 Earlier this week I ran in Goodwill and found an inexpensive coffee table. It was solid wood and sturdy, but the finish was flaking off and was in need of a much needed facelift. 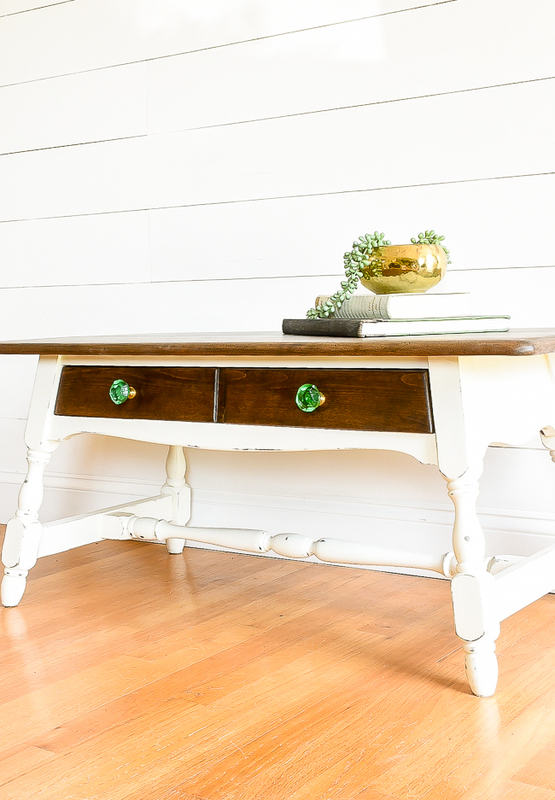 The style of the table was a little more country than I would have liked, but I knew with new stain, a little paint and a splash of color I could give it a fresh new look. I'm not sure what was originally used to seal the stain, but it was literally crusty and flaking off. The worst part was on the drawers, but after further examination, I noticed that the entire table needed to be sanded. 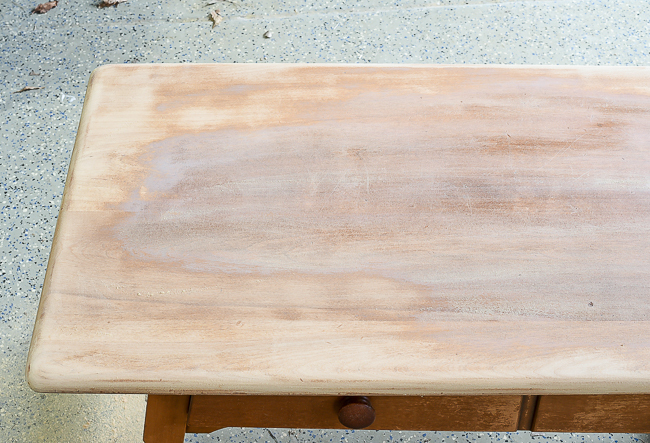 I've used Citistrip and other furniture strippers in the past but I find the easiest way to quickly refinish furniture is with simple sanding. It creates a lot of dust, but there's no waiting and it's far better than dealing with sticky, smelly and messy furniture strippers. I start with 80 grit sandpaper on my Corner Cat (an orbital sander would work too) and sand in the direction of the wood grain, stopping every so often to wipe off the dust. Once I get the majority of the stain removed, I switch to 120 grit sandpaper to make sure the wood is nice and smooth. 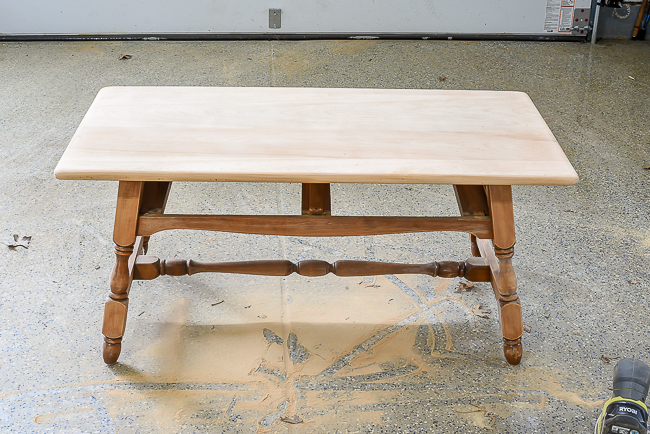 Since the finish on this particular table was in such rough shape I ended up sanding the entire table. 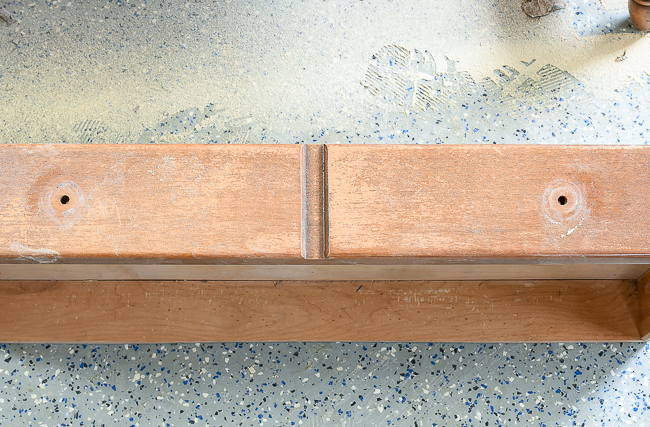 I didn't sand the base down to the bare wood, but I did remove the top layer that was flaking off. Basically, I just wanted a nice clean slate for the new paint. 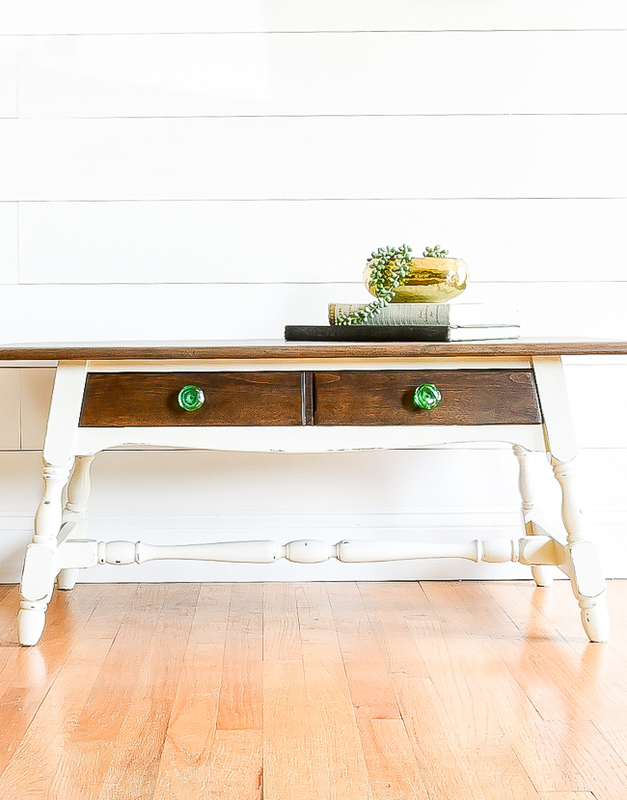 Before applying the paint and stain I wiped down the entire table with Simple Green and let it dry. You can use tack cloths, but Simple Green and paper towels work just as good. 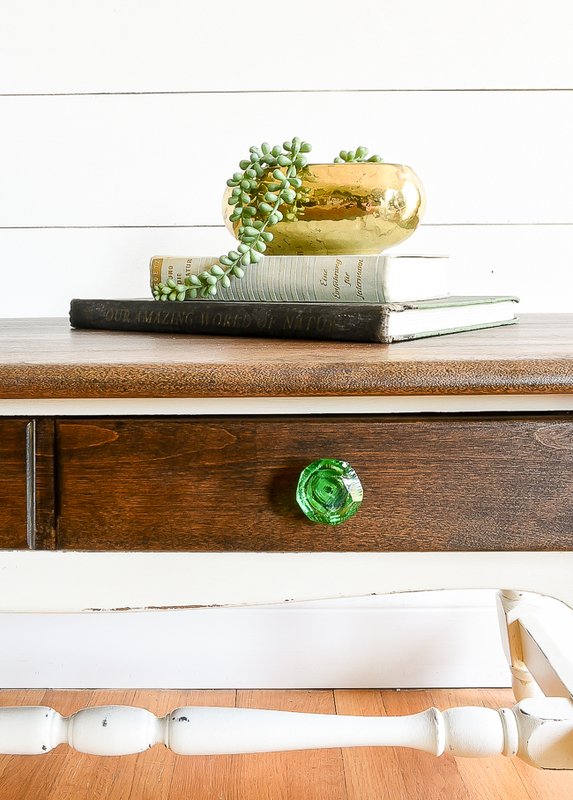 Using an inexpensive foam brush I added two coats of Minwax Espresso stain to the drawer and top of the table. 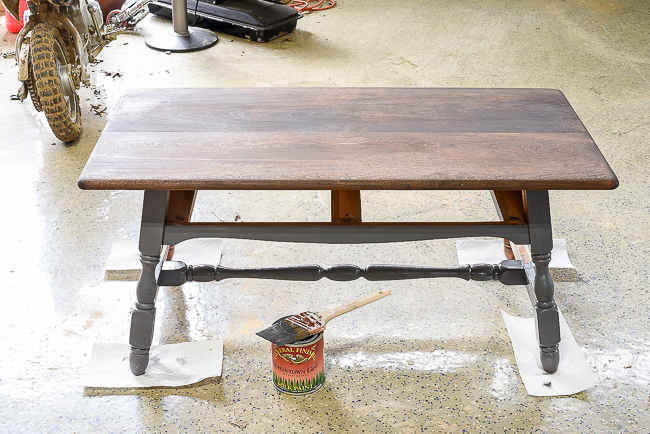 I like the look of two-tone furniture, so I painted the base using General Finishes Queenstown Gray. I wasn't thrilled with how the stain looked with the gray paint, so I went ahead and added two coats of Plaster chalk paint over the gray. I hand sanded the base for a naturally distressed look then sealed the entire table with water based polycrylic for a nice durable finish. I was planning on swapping out the original knobs with simple porcelain ones, but they seemed a little too safe and generic. 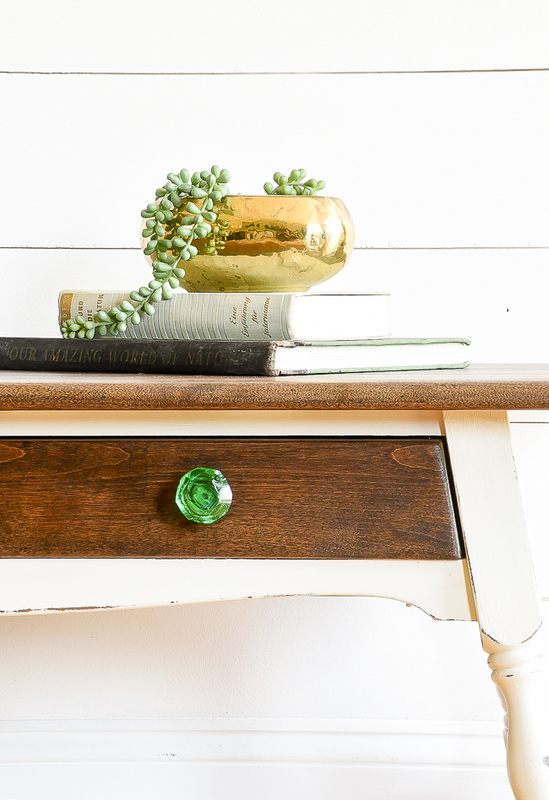 That's when I remembered I had a couple gorgeous Emerald green knobs that I knew would be perfect for a bright pop of color. 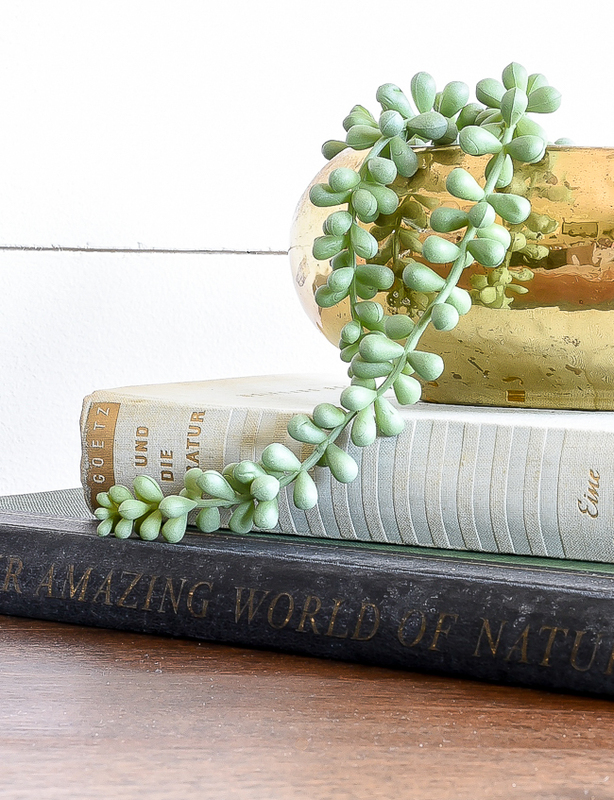 They definitely make a statement and help the table from feeling too country farmhouse. Those of you that are super observant may have noticed that the blue and gold book isn't in English. I have no idea what language it's in, but it has a pretty textured binding that I couldn't resist. Does anyone else pick up old books just because they have pretty covers and bindings? 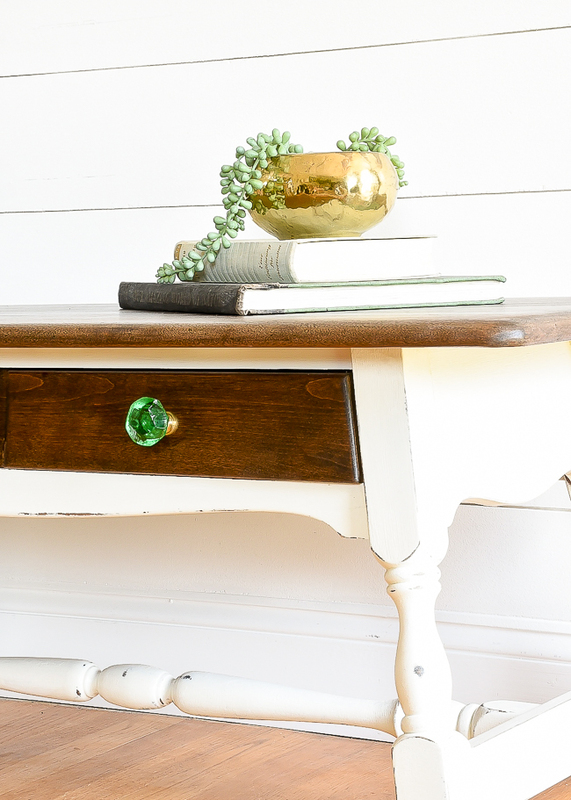 I hope this quick little table makeover inspires you to think twice about simply painting a piece of furniture or passing it up altogether. it's such a huge improvement! and those green knobs make it! i think the book looks to be in german? Oh my goodness! Absolutely amazing! You have a great eye-and I love seeing what you do with your furniture. I have some great old Reader's Digest books that I took the book covers off of, to find some beautiful colors on the hardcovers!